Debit cards, with their associated interchange revenues, offer an opportunity for financial institutions to replace fee income lost through regulatory change. As they have become a preferred consumer payment method and a mainstay in checking account offerings, institutions are seeking ways to increase debit card usage among their consumer and business account holders in order to drive increased loyalty, broader relationships and sustained profitability. 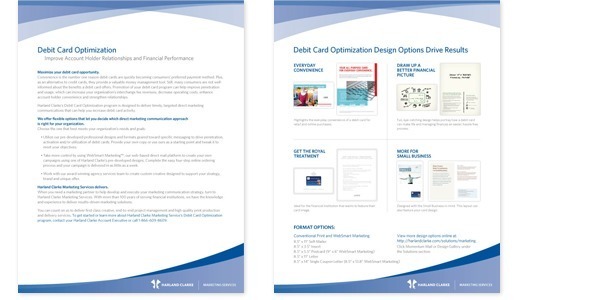 MindBridge Marketing developed a turnkey direct marketing program to assist clients in their efforts to increase debit card usage. MBM developed a variety of communication design, copy and format options, as well as client-facing sales materials and internal training support in response to this challenge. Financial institution clients were armed with materials and tools to assist them in increasing debit card penetration, usage and fee income. ©2015 COMPANY ALL RIGHTS RESERVED.